Well it continues to change at our gate you have heard the saying if you don’t like it wait it will change, well it has been that way here for the last two days. 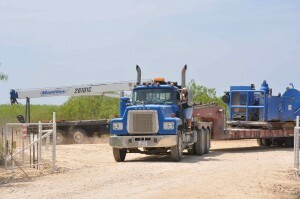 Seems like every big boss in south Texas for this company arrived yesterday then here came the rigs, first a packer rig they had this huge Motor pump Yep the motor took up a 53foot triple axle trailer, + three other vehicles and a Crane accompanied it. 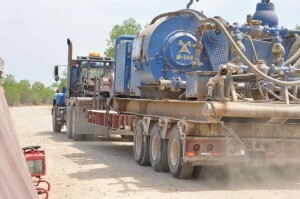 As I understood it this machine puts a very high pressure on the well to create a oil pool down at the bottom. They started to work on well #1 then today came the tubing rig and The yesterday rig is moving to well #2 and the tubing rig is to set upon well #1 tomorrow. Now that you are as confused as I am and with all the added traffic for the past 2 days one can see why we do not always get around to posting every day.With every thing happening so fast we did not get to get the pictures that we like to capture of the units coming in.